1. Preparation: During the weeks of practice prior to the 2012 Super Bowl, Bill Belichick made sure that the team was prepared for every single possible scenario that would occur on gameday. Belichick even had his team prepared for an important situation that many coaches may have overlooked: Halftime. Halftime during a regular season game is about 12 minutes, whereas the Super Bowl halftime can be nearly twice as long because of the star-studded musical performances. To prepare for this, just as he as done in the past, Belichick had his team go into the locker room for 30 minutes during the middle of practice to simulate the situation on gameday. (I assume that he used this same technique this year to prepare his team for Super Bowl LI and Lady Gaga, just as he prepared them for Madonna in 2012.) After this simulated halftime, the team came back out and continued practice. This is something that a veteran team like the Patriots knew to prepare for, while an inexperienced/young team like Atlanta may not have. 2. Emotional Control: After Tom Brady played a very “un-Brady like” first half of football, he could’ve easily gotten frustrated and packed it in after his soul-crushing Pick 6 to Robert Alford right before halftime to put the Falcons up 21-0. Instead, Tom Brady did what Tom Brady always does: kept his composure, remained calm, and elevated his game to help the lead the Patriots to a 34-28 victory; securing his 5th Super Bowl title. This exceptional ability to control emotions was also seen on the defensive side of the ball. After Julio Jones made jaw-dropping sideline catch to put the Falcons in field goal range late in the 4th Quarter and effectively end the game, the Patriots defense stepped up, drove Atlanta’s offense backwards, and forced them to punt the ball back to Brady and the offense–setting up the game-tying 91 yard drive. 3. Hand-Eye Coordination: During the Patriots game-tying drive, Julian Edelman made arguably one the greatest plays in Super Bowl history when he caught deflected pass an inch from the ground while tangled up between 3 Falcons defenders. This required elite hand-eye coordination and anticipation. If Edelman lost focus for even half of a second, the pass is probably incomplete…and the Patriots likely fly home to Foxboro without their 5th Lombardi Trophy. 4. Mental Stamina: Playing an entire football game is both physically and mentally exhausting–but the Super Bowl takes exhaustion to a new level. In the weeks leading up to the Super Bowl, players must do their best to remain focused and continue preparing for game day despite the media circus and national spotlight that they deal with at all times–it’s easy to see how any player could be overwhelmed and mentally fatigued come Super Bowl Sunday. 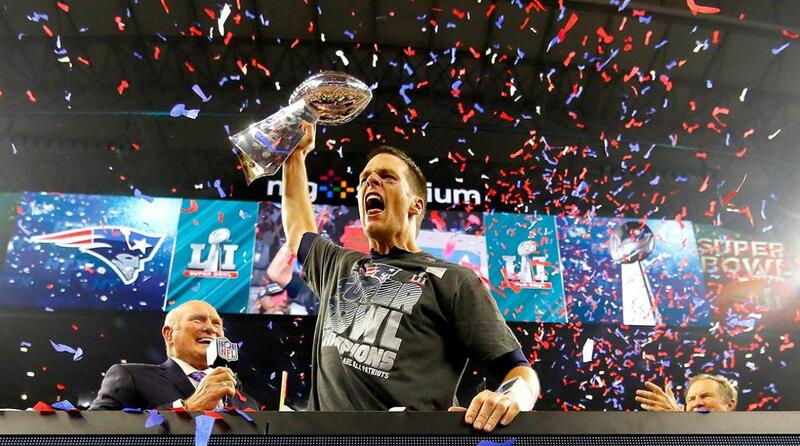 The Patriots had the mental stamina to overcome the events prior to game day, as well as playing in the biggest and most physically and mentally demanding game of the season in front of over 100 million viewers and intense pressure– and yet, they were still able to perform at an elite cognitive level late in the 4th Quarter, and ultimately make the championship plays to win in overtime. 5. Recognition: The Patriots ran nearly twice as many plays as the Falcons (93 to 46), and had possession for twice as long (40:31 to 23:27). Towards the end of the game, the Patriots recognized that the Falcons defense was becoming both physically and mentally fatigued. The man-to-man defense that had worked earlier in the game was not as effective late in the 4th quarter when Atlanta’s defensive backs were exhausted from coverage, and the defensive line could no longer generate significant pressure on Brady. The Patriots recognized this, took advantage, and executed.